There are any number of events that can happen in a person’s life that can trigger a downward spiral into depression. Loss of a loved one, financial difficulty, sudden change in lifestyle. 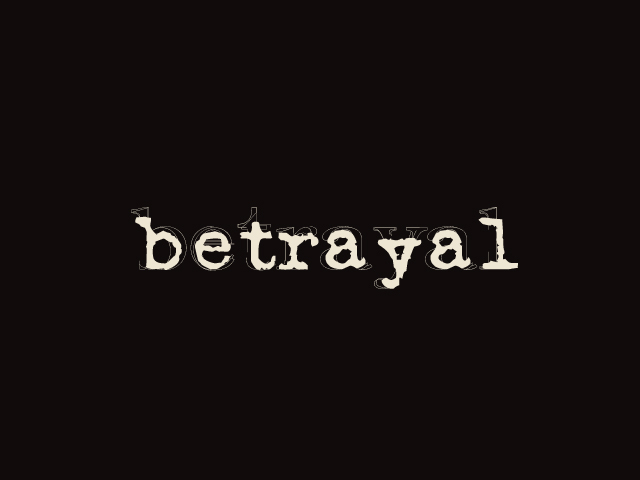 One event that I don’t hear very often, though, is betrayal, particularly betrayal by someone close to someone else. Sometimes trust being broken can shatter a person’s perception of the world or of a situation. When reality is no longer a certainty, security can crumble and emotions can become fragile. While I was taking a break from writing here, I suffered what I considered to be a major betrayal at the hands of some people I trusted. I am sure they did not perceive what happened this way, but in my mind this is most certainly what happened. To be honest, I still haven’t gotten over it yet. The anger and the hurt have not faded one iota, and I’m not so sure at this point they ever will. This type of anger and hurt can drive a person into isolation. Number one, they become unsure of who they can actually trust anymore. Number two, they feel particularly wounded and may view others as potential threats to wound them further. And, number three, they have suffered a sort of humiliation that has battered their pride and made them ashamed to face other people. Isolation is a prime breeding ground for depression, since one of the main symptoms of the disease is a feeling of being utterly and totally alone. Isolation just makes that feeling a reality. It is no surprise, then, that my depression has been markedly worse since this incident occurred. What has been slightly surprising, though, is the relatively small number of people who know of what occurred who have attempted to drag me out of my hole. I think because of the obvious amount of hurt that is displayed by someone who has suffered a betrayal of some sort is so noticeable, people have a tendency to give them a wide berth, as if they just “need some space” to get over it. In reality, what they need is someone to reach out and help them re-establish trust in the people around them. Just from my own experience with this, I have come to believe two things. One, that we should try with all of our might to not betray anyone, most especially people we have close relationships with, and, two, that we should keep a special eye on the betrayed to make sure they do not slide off into the cracks. The only hope someone who has been betrayed may have of bouncing back is someone else reaching out to them.